A Senate panel on Thursday approved a Veterans Affairs Department spending bill that targets senior executives in response to the recent scandals that have engulfed the agency. The Senate Appropriations Committee’s Military Construction and VA fiscal 2015 funding measure would place a temporary ban on bonuses for some agency doctors and executives. The committee also accepted an amendment to include the House-backed bill that would ease the firing of senior executives at the agency. The appropriations bill, which provides $165.4 billion in funding for VA and military construction for fiscal 2015, was approved unanimously and now heads to the full Senate. “At a time when the VA is being rocked by turmoil over allegations of secret wait lists at hospitals, on top of ongoing challenges to eliminate the claims processing backlog, Congress must move quickly to provide the leadership, resources, oversight and accountability needed to assure that veterans are receiving the timely and quality health care and benefits they deserve,” said Sen. Tim Johnson, D-S.D., chairman of the VA appropriations subcommittee. The bonus provision would prohibit performance awards for Veterans Health Administration medical directors, assistant medical directors and Seniors Executive Service employees until the agency’s inspector general has completed its investigation into extended wait times and cover ups at VA facilities and “reforms have been implemented.” The bill would provide the inspector general $5 million more than President Obama’s request and the 2014 level, in part to ensure it has the resources to conduct the investigation. The House in April approved its VA spending bill, which included a provision to prohibit bonuses for all VA senior executives in fiscal 2015. On Wednesday, the House easily passed the VA Management Accountability Act, which would give Secretary Eric Shinseki enhanced authority to terminate or demote senior executives at the agency. 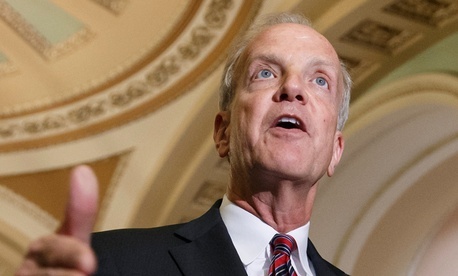 Sen. Jerry Moran, R-Kan., introduced the same bill -- which federal employee advocates have derided as an unconstitutional political gambit that will ultimately drive qualified professionals away from the VA -- as an amendment to the spending bill. “We want to make sure we have quality people in the hospitals and I’m sure this gets to that,” Tester said. The amendment, however, was adopted unanimously by voice vote.